This paper describes the treatment outcomes of CEM cement as an artificial apical barrier in immature human teeth or teeth with apical root resorption. The study was peer reviewed and approved by a local board of research and ethics. Included were 13 necrotic single-rooted teeth with open apices (immature [n = 7]; mature with apical root resorption [n = 6]) which were treated in an endodontic private clinic. Patients were between 8 and 35 years old. Medical histories of all patients were non contributory. Except for three cases, which were referred for retreatment, cold test was conducted for all teeth using Endo-Frost cold spray (Roeko, Coltene Whaledent, Langenau, Germany) to establish a pulpal diagnosis. None of the teeth responded to the cold test. All of the teeth had normal periodontal probing and showed physiologic mobility. Palpation and percussion tests were carried out. A summary of the descriptive data of cases in the first visit are shown in [Table 1]. Informed written consents were obtained from all patients. The teeth were treated with or without interappointment CH dressing. A tooth was treated with interappointment dressing if in the first visit, the root canal could not be dried at the end of cleaning procedure and there was continuous suppuration or exudation. After local anesthesia with 2% lidocaine and 1:80000 epinephrine (Daroupakhsh, Tehran, Iran) and rubber dam isolation, root canals were accessed using a diamond-coated fissure bur (Diatech, Heerbrugg, Switzerland) and were cleaned using passive irrigation with 20 mL of NaOCl 5.25% and gentle filing with a size 50 K-file (Dentsply Maillefer, Ballaigues, Switzerland). Then, the root canals were dried with size 50 paper points (Ariadent, Tehran, Iran). The treatment procedure for teeth treated with interappointment dressing was the same as the aforementioned group, except using CH as an interappointment root canal dressing. After drying canals with paper points, the CH powder (Ariadent, Tehran, Iran) was mixed with normal saline to a creamy consistency and was placed into the root canals by the counterclockwise rotation of a size 50 K-file and the teeth were temporized with Cavite (Ariadent, Tehran, Iran). After 2 weeks, the patients were recalled and the CH dressings were removed by irrigating with alternating solutions of 5.25% NaOCl and 17% EDTA (Ariadent, Tehran, Iran); the canals were then dried. Once the canal was dry at the working length with no exudates, CEM cement powder and liquid (BioniqueDent, Tehran, Iran) were mixed according to the manufacturer's instructions and delivered to the dried canals using a sterile amalgam carrier and gently adapted to the apical portion of the canals using pre-fitted endodontic pluggers (M-series, Dentsply Maillefer, Tulsa, USA) until the apical plug reached the length of 4-5mm. Correct placement of CEM cement apical plugs was assessed radiographically [Figure 1],[Figure 2],[Figure 3],[Figure 4],[Figure 5],[Figure 6]. The root canals were filled with normal saline, and the teeth were temporarily restored. One day later, the CEM cement setting was checked. 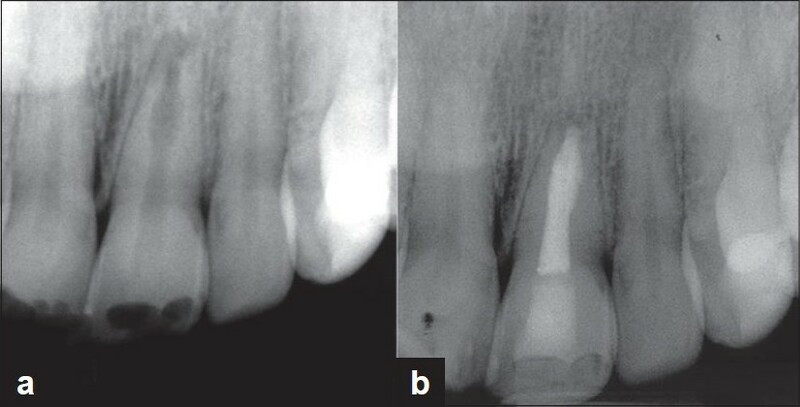 Except one case (case 10) [Figure 5] which was fully obturated with CEM cement because of internal resorption in the mid-root area, in other cases the remainder of canal space was either back-filled using sectional warm vertical compaction of gutta-percha (Ariadent, Tehran, Iran) and sealer (Pulp Canal Sealer, Kerr, MI, USA); or restored with a prefabricated post and composite material applied directly on the CEM cement. Finally, all teeth were permanently restored. Figure 5: (a) Preoperative periapical radiograph of case 8; a 35-year-old female with chief complaint of buccal swelling and pain in palpation on maxillary left central incisor. The tooth had a previous inadequately obturated root canal treatment with apical resorption and a very slight apical rarefaction. (b) Post-operative periapical radiograph. (c) Follow-up radiograph at 12 months after treatment. The tooth was functional without recurrence of swelling and sensitivity to percussion and palpation. Figure 6: (a) Preoperative periapicel radiograph of case 10; a 30-year-old female with chief complaint of sinus tract on maxillary left central incisor and history of impact trauma. The tooth was necrotic with internal and apical resorption. Treatment was performed without inter-appointment dressing. Because of presence of internal resorption in midroot, the canal space completely obturated with CEM cement. (b) Follow-up radiograph at 12 months after treatment. The sinus tract resolved and preiapical osseous lesion healed. Cases 1, 6, and 8 [Figure 1],[Figure 4] and [Figure 5], had previous inadequate obturations. Therefore, prior to cleaning procedure, gutta-percha was removed using Gates Glidden drill size 3 (Dentsply Maillefer, Tulsa, OK, USA) in the coronal two-thirds and size 40 H-file (MANI, Mani Inc, Japan) in the apical portion of the canals. Then, the cleaning and irrigation and interappointment procedures were followed as described. In case 1, the patient was referred for retreatment of tooth #9, since the tooth #8 was immature and inadequately obturated too [Figure 1]a, the clinician decided to retreat it. It was an opportunity to use CEM cement and MTA apical plugs in the same patient. Thus, after removing gutta-percha and irrigating the tooth #8, the MTA powder (ProRoot tooth colored MTA, Dentsply, Tulsa Dental, OK, USA) and distilled water were mixed according to the manufacturer's instructions and placed in the apical portion of the canal [Figure 1]b). Subjects were followed clinically and radiographically at 3-month intervals until radiographic healing was completed. 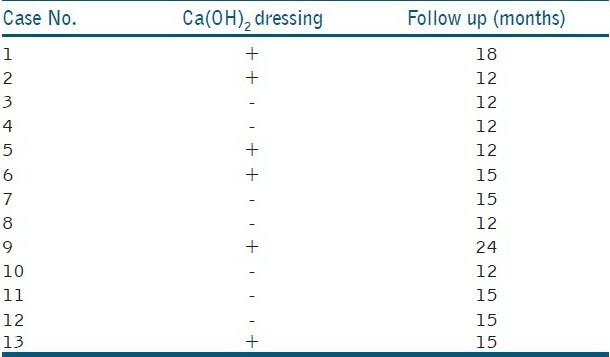 Summary of treatments and follow-up periods are represented in [Table 2]. The mean follow-up time period was 14.5 months. All of the cases were functional without clinical signs/symptoms of periradicular diseases including sensitivity to percussion/palpation, presence of soft tissue swelling/redness, and presence of sinus tract. Radiographically, complete osseous healing of the lesions was observed in all of the teeth [Figure 1],[Figure 2],[Figure 3],[Figure 4],[Figure 5],[Figure 6]. s It has been postulated that the material of choice for apexification procedure should have a cemento-conductive potential. MTA has the ability of hard tissue induction with a high degree of structural integrity when used as the apical plug in open apex teeth , . In a human study, the outcomes of apexification with either MTA or CH were compared. After a 12-month follow-up period, unlike CH group, all 15 cases treated with MTA were clinically and radiographically successful. Other studies reported high clinical and radiographic success rates for one or two visit MTA apical plug techniques. , Therefore, MTA is seemingly the biomaterial of choice for the artificial apical barrier technique. The calcium ion released from MTA can induce a reaction with environmental phosphorus, which leads to hydroxyapatite crystal formation on the surface of MTA  and MTA-dentine interface. It has been concluded that this bioactive reaction is responsible for biocompatibility, sealing ability, and cementogenic/dentinogenic properties of MTA. , In addition, sealing ability of MTA, as a root-end filling material, increases when stored in phosphate buffer saline (PBS); a phenomenon which does not happen in normal saline. However, CEM cement releases calcium and phosphorus ions from indigenous sources and, unlike MTA, has the ability of induction of hydroxyapatite crystal formation in the absence of environmental phosphorus. This ability of CEM cement can partially explain its biocompatibility and hard tissue induction potential demonstrated in several studies. Studies have revealed that the cementogenic properties of CEM cement are similar to MTA when used as a root-end filling material. In this study, case 1 [Figure 1] represents a unique comparison between CEM cement and MTA apical plugs within 18 months. The same biological properties of these two biomaterials can partly explain the successful findings in this case. The effects of CH premedication on sealing ability of MTA apical plugs have been studied before. Studies have revealed that CH pretreatment adversely affects the sealing ability of white MTA apical plugs. Using scanning electron microscopic examination, one study has demonstrated that alternating irrigation with NaOCl and EDTA results in complete removal of CH from dentinal walls  Although there is no evidence of the effects of CH remnants on sealing ability of CEM cement apical plugs, we decided to use a promising method for removing CH; the same as Pace et al. In the presented case series, use of CEM cement as an artificial apical barrier showed successful clinical and radiographic outcomes in an average follow-up time of 14.5 months. The importance of long-term follow-up for apexification cases is emphasized in several studies. , Thus, annual follow-up of these cases is recommended. In conclusion, considering the advantages of CEM cement over MTA, especially its improved color, handling, and bactericidal effects, the authors believe that CEM cement might be an appropriate biomaterial to be used as an artificial apical barrier in open apex teeth. However, more clinical studies with longer follow ups and more samples are recommended. 1. Camp J, Fuks A. Pediatric Endodontics: Endodontic Treatment for the Primary and Young Permanent Dentition. In: Cohen S, Hargreaves K, Keiser K editors Pathways of the Pulp. 9 th ed. St Louis: Mosby Elsevier; 2006. p 822-82. 2. Rafter M. Apexification : A review. Dent Traumatol 2005;21:1-8. 3. Sheehy E, Roberts G. Use of calcium hydroxide for apical barrier formation and healing in non-vital immature permanent teeth: a review. Br Dent J 1997;183:241-46. 4. Andreasen J, Farik B, Munksgaard E. Long-term calcium hydroxide as a root canal dressing may increase risk of root fracture. Dent Traumatol 2002;18:134-7. 5. Shabahang S, Torabinejad M, Boyne P, Abedi H, McMillan P. A Comparative Study of Root-End Induction Using Osteogenic Protein-I, Calcium Hydroxide, and Mineral Trioxide Aggregate in Dogs. J Endod 1999;25:1-5. 6. Asgary S, Eghbal M, Ehsani S. Periradicular Regeneration after Endodontic Surgery with Calcium-enriched Mixture Cement in Dogs. J Endod 2010;36:837-41. 7. Torabinejad M, Parirokh M. Mineral Trioxide Aggregate: A Comprehensive Literature Review-Part II: Leakage and Biocompatibility Investigations. J Endod 2010;36:190-202. 8. Parirokh M, Torabinejad M. Mineral Trioxide Aggregate: A Comprehensive Literature Review-Part I: Chemical, Physical, and Antibacterial Properties. J Endod 2010;36:16-27. 9. El meligy O, Avery D. Comparison of Apexification With Mineral Trioxide Aggregate and Calcium Hydroxide. Pediatr Dent 2006;28:248-53. 10. Pace R, Giuliani V, Pini Prato L, Baccetti T, Pagavino G. Apical plug technique using mineral trioxide aggregate: Results from a case series. Int Endod J 2007;40:478-84. 11. Witherspoon D, Small J, Regan J, Nunn M. Retrospective Analysis of Open Apex Teeth Obturated with Mineral Trioxide Aggregate. J Endod 2008;34:1171-6. 12. Asgary S, Kamrani F. Antibacterial effects of five different root canal sealing materials. J Oral Sci 2008;50:469-74. 13. Parirokh M, Torabinejad M. Mineral Trioxide Aggregate: A Comprehensive Literature Review-Part III: Clinical Applications, Drawbacks, and Mechanism of Action. J Endod 2010;36:400-13. 14. Asgary S, Shahabi S, Jafarzadeh T, Amini S, Kheirieh S. The Properties of a New Endodontic Material. J Endod 2008;34:990-3. 15. Asgary S, Eghbal M, Parirokh M, Ghoddusi J. Effect of two storage solutions on surface topography of two root-end fillings. Aust Endod J 2009;35:147-52. 16. Asgary S, Eghbal M, Parirokh M. Sealing ability of a novel endodontic cement as a root-end filling material. J Biomed Mater Res 2008;87A:706- 9. 17. Tabarsi B, Parirokh M, Eghbal M, Haghdoost A, Torabzadeh H, Asgary S. A comparative study of dental pulp response to several pulpotomy agents. Int Endod J 2010;43:565-71. 18. Felippe W, Felippe M, Rocha M. The effect of mineral trioxide aggregate on the apexification and periapical healing of teeth with incomplete root formation. Int Endod J 2006;39:2-9. 19. Torabinejad M, Pitt Ford T, Mckendry D, Abedi H, Miller D, Kariyawasam S. Histologic assessment of mineral trioxide aggregate as a root-end filling in monkeys. J Endod 1997;23:225-8. 20. Fridland M, Rosado R. MTA solubility: A long term study. J Endod 2005;31:376-9. 21. Mozayeni M, Milani A, Marvasti L, Asgary S. Cytotoxicity of calcium enriched mixture cement compared with mineral trioxide aggregate and intermediate restorative material. Aust Endod J 2011;[In press]. 22. Sarkar N, Caicedo R, Ritwik P, Moiseyeva R, Kawashima I. Physicochemical basis of the biologic properties of mineral trioxide aggregate. J Endod 2005;31:97-100. 23. Parirokh M, Askarifard S, Mansouri S, Haghdoost A, Raoof M, Torabinejad M. Effect of phosphate buffer saline on coronal leakage of mineral trioxide aggregate. J Oral Sci 2009;51:187-91. 24. Stefopoulos S, Tsatsas D, Kerezoudis N, Eliades G. Comparative in vitro study of the sealing efficiency of white vs grey ProRoot mineral trioxide aggregate formulas as apical barriers. Dent Traumatol 2008;24:207-13. 25. Calt S, Serper. A Dentinal tubule penetration of root canal sealers after root canal dressing with calcium hydroxide. J Endod 1999;25:431- 3. Torabzadeh, H. and Asgary, S.
nosrat, a. and kim, j.r. and verma, p. and chand, p.s. haghgoo, r. and arfa, s. and asgary, s.